Typically installed near Vibratory Shakeout Conveyors, these digitally controlled manipulators are engineered to solve tough material handling problems. Operators can pick up heavy castings and set them on pallets, sort large and/or hot parts, or knockoff gating and risers all with one machine. 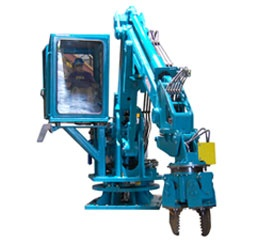 We offer several attachments to fit your operation’s specific needs such as Hot Castings Grapple, Riser Knockoff Impactors™, Combination Grapple/Impactor™, Runner Breaker Grapples, or Specialized Grapple Solutions engineered to your specifications. Perfect for No-bake or Green Sand foundry systems with medium to large castings, our application engineers work with you to choose manipulator capacity, attachments, reach and functionality, controls, cab location, and hydraulic power unit location to suit your production and installation requirements. Check out the video below to see the Action® Manipulator in action with the Combination Grapple/Impactor™ attachment. In-Cab PID tuning of manipulator motion, for personalized control. Best of both worlds… superior performance and reliability, with industrial-standard components. Visit the Action® Manipulator product page for more information, images, or to get in touch with a Sales Engineer today to discuss how an Action® Manipulator can benefit your operation.